Learn about how service animal laws effect the food establishment industry. 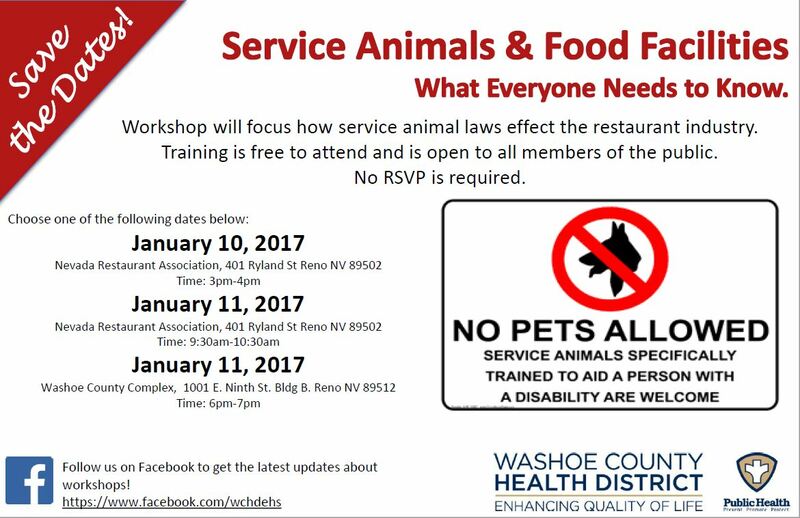 Reno, NV – The Environmental Health Services (EHS) Division of the Washoe County Health District (WCHD) would like to invite you to attend a workshop to learn about service animals in food establishments. The purpose of this workshop is to provide information to businesses and individuals about service animal laws and how they affect industry. EHS will be focusing on the science behind not allowing pets into restaurants and how to decipher pets from service animals. The workshops are free to attend, no RSVP is required. All workshops will be covering the same material. At the conclusion of the workshop, the public will have a chance to be part of a Q&A session.